Ok so you only need a pretty island to showcase engine stuff. Any lists of what those engine features are that should be showcased? Only visual features like normal maps? I would add them anyways, at best make PBR materials if OpenMW supported those. I guess its best for me to scribble something and show it here. I am confident that I can pull off a little island with unique models, but I have not a clue about anything related to coding and very little experience with animation and rigging. No restricitons in regards to setting? I would propably go for something medieval with magic anyways because thats what the gameplay was made for, but are there any restrictions? Needs to be european styled medieval island? PeterBitt wrote: Ok so you only need a pretty island to showcase engine stuff. Any lists of what those engine features are that should be showcased? Only visual features like normal maps? I would add them anyways, at best make PBR materials if OpenMW supported those. If you´ve no idea what features to do, go on the engine Roadmap, check "Show completed versions" and look at the features already done. PeterBitt wrote: I guess its best for me to scribble something and show it here. I am confident that I can pull off a little island with unique models, but I have not a clue about anything related to coding and very little experience with animation and rigging. I think you´re fine on the coding side. We have a lot of coders browsing these forums. PeterBitt wrote: No restricitons in regards to setting? I would propably go for something medieval with magic anyways because thats what the gameplay was made for, but are there any restrictions? Needs to be european styled medieval island? Has to utilize spell system, needs to be on an island. That´s pretty much it. Alright I understand now. The listed engine features are easy to showcase I guess. The tasks for modelling I can ignore I guess. 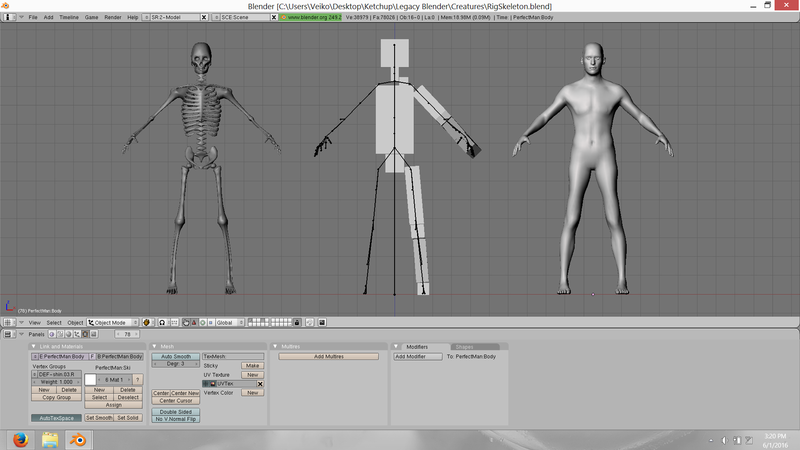 Creatures and human bodies will be added anyways, problem is finding animators who can make new skeletons. But I think this should be fun to try, I wanted to make a whole environment for a while and this is a good reason. I am working full time (and more) tho. PeterBitt wrote: Creatures and human bodies will be added anyways, problem is finding animators who can make new skeletons. I´m thinking of contributing my work on skeleton rig and animations. It would at the very least give us a fully functional NPC who can equip armor, fight, cast spells, pick locks, swim, do everything pretty much. I do have my agenda in this, which is potentially using any CC-BY-3.0 heads/hair/armor assets this project produces in my own game. That looks sweet! At first I would only work on the environment anyways and would put in placeholders for creatures and humans. Looks like we have similar plans, I also would want this to maybe be the start of my own game, at least for training purposes or to use the models I create for this. Maybe this is a deal breaker for this open source project: I dont want my models to be used in other games, not even mods. I have good reasons for that, but maybe this is totally against your guys values? Maybe its not even possible to protect my models when the engine is open source? I have no idea. But this is all theory, I need to make something first. I am in favor of the project being CC-BY-3.0. It saves the assets from being stuck in a legal black hole. Seconded... Thank you PB! You want an Island, you get an Island. I'm thinking it is best to include only in the example-suite and not in the template due to size. We want to keep the template to a minimal. DestinedToDie is correct, you have to abide by the license. The good news is, everyone will know you did it and will have to give you proper recognition for your work. The bad news is, anyone can copy it and modify/remix it. To be fair, we're not asking for a full proper game... just something we can demo the engine. I wouldn't put anything into it you would want to keep proprietary. PeterBitt wrote: I dont want my models to be used in other games, not even mods. I have good reasons for that, but maybe this is totally against your guys values? Maybe its not even possible to protect my models when the engine is open source? I have no idea. psi29a wrote: The good news is, everyone will know you did it and will have to give you proper recognition for your work. The bad news is, anyone can copy it and modify/remix it. Yep. It´s not as if your work gets destroyed as soon as someone else uses it. You will get credit for it and can still use it to make your very own game later down the line. PeterBitt wrote: Maybe this is a deal breaker for this open source project: I dont want my models to be used in other games, not even mods. I think that would largely defeat the purpose. Creative Commons or bust. In other news, I'm still working on getting old Blender to build on my system, but progress is being made. I've already overcome several stumbling blocks, but I have a feeling that there will be more. I'd be in some kind of heaven if there were a build of Blender 2.49b for 64-bit armhf architecture including NIF export scripts, but alas the universe is a cold and unforgiving place, and so I mush on. If we're thinking of it as just a tech demo we should figure out who we're targeting. Sole indie developers? Indie teams? The public? For the sake of this post I will assume we are trying to attract modders to make content for OpenMW. Let's look at what many would argue Morrowind's main flaw to be: that is, combat. It's slow, it doesn't give the player any clear indicator as to what they got wrong nor how to improve and it's purely done via numbers the player can't see. So, we make it more impactful, the player feels like their actions determine the outcome and not by some dice role that is obfuscated from the player's view.